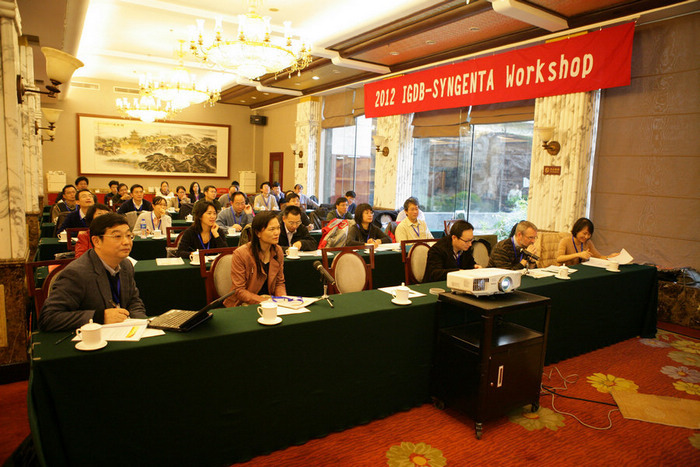 2012 IGDB-Syngenta Workshop was held in Beijing on November 10,2012. More than thirty scientists from the Institute of Genetics and Developmental Biology (IGDB), Chinese Academy of Sciences, and the Syngenta Biotechnology (China) Co., Ltd (SBC) attended the workshop. Director Yongbiao Xue of IGDB and President David O’Reilly of SBC overviewed the collaboration during the past five years, respectively. They both appreciated the win-win achievements in the collaboration and wished to further the partnership in the future. Progresses of the collaborative projects and the status of the gene leads in the collaboration pipeline between the two parties were presented. Several new group leaders of the institute introduced their interested fields and achievements in scientific research. In addition, Potentials for Further Collaboration were discussed in the workshop and both parties hoped to communicate more to promote research and development of agricultural biotechnology in both China and the rest of the world.